26 yrs old female with PM/ICD implanted for conenital Long QT Syndrome referring one syncopal episode before our arrival. 3 more consecutive episodes occurred during the observation. The 12 Leads EKG is also shown. The symptoms (and the EKG findings ) stopped after Amio 150 mg. The patients was asyntomatic until the arrival in ED. If the ryhthm during syncopal episodes is pretty clear, the 12 L EKG analysys is really intriguing. The PM is in VVI mode, but it looks like the atrial sensing is not working and so the ventricle is contracting at his own pace resulting in a rate of 45 bpm. 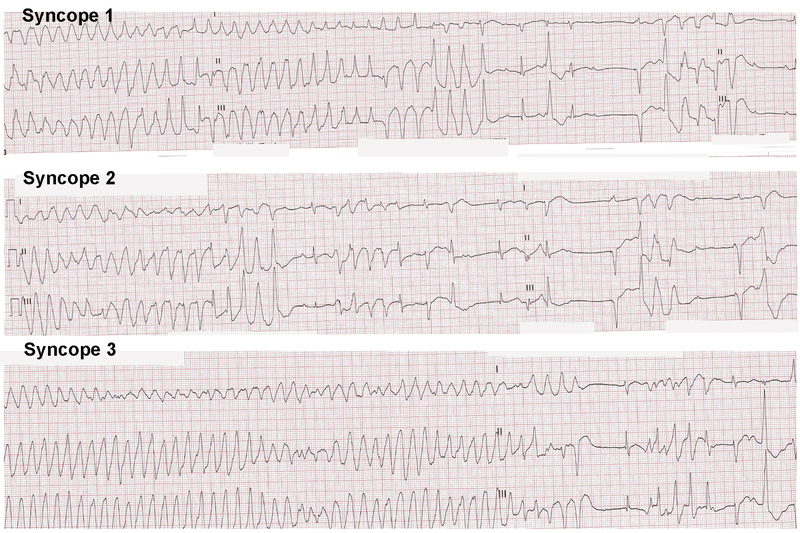 At this rate, as shown on the 12 leads EKG, the QTc is 552 ms (normal value <460 ms in women). This increases the probability of torsade. It looks like even the ICD is not working properly cause of the absence of shock despite the duratio of Torsade. In conclusion, malfunctioning PM inducing bradycardia and Torsade. (Very)Suspected malfunctioning ICD. Amio is not the appropriate therapy (but still an option) in this case. Magnesium 2 mg is the first choice therapy for Torsade. Lido and isopreterenolo are other reasonable options. ← Do you needle cric?